Souvenirs of Queensland readily reflect the distinctive nature of the state and provide inexpensive mementoes. 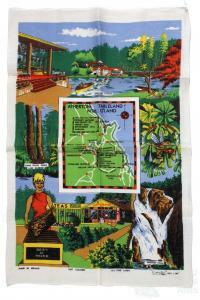 Many souvenir tea towels utilise a prominent map of the whole state or individual regions. The graphic design process of tea-towel production, which does not favour full-colour photographic material, lends itself to the use of maps and pictorial insets of particular activities. Clustered around the maps are the natural and built environment which communities consider important, and hopefully, appealing to their visitors. 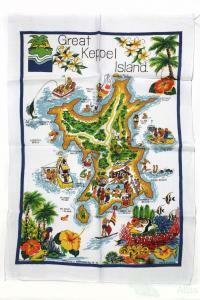 Tea-towels are cheap, readily transportable and functional souvenirs to be distributed to friends after a memorable holiday, or kept. Because of the texture of the linen cloth, printing on tea-towels cannot achieve the detail of printing on paper but with the simplification of the motif and the striking effects of design and colour, tea-towels approximate the visual impact of posters. 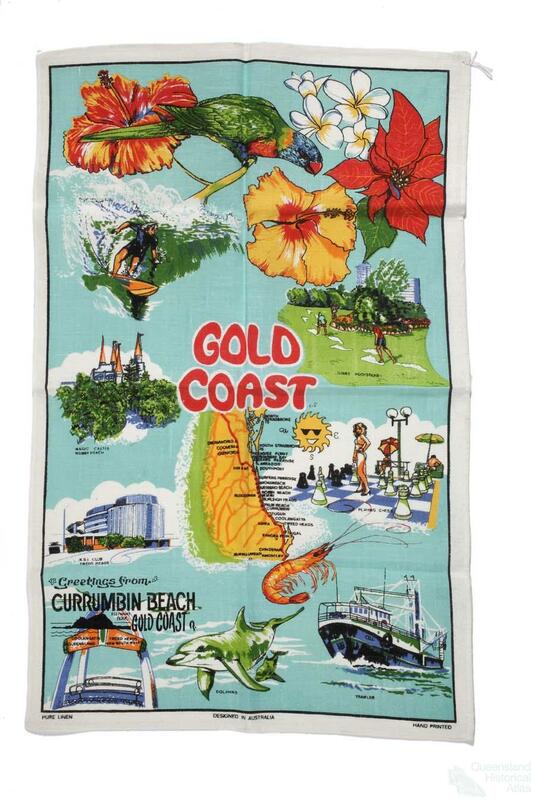 The pictorial imagery on souvenir tea-towels collected from Queensland reveals how particular places, businesses and organisations – from coastal resorts to sugar mills to the Country Women's Association – have attempted to display their own landscapes. Tea-towel production paralleled the development of mass tourism after World War II, but dating individual tea-towels precisely can be problematic. 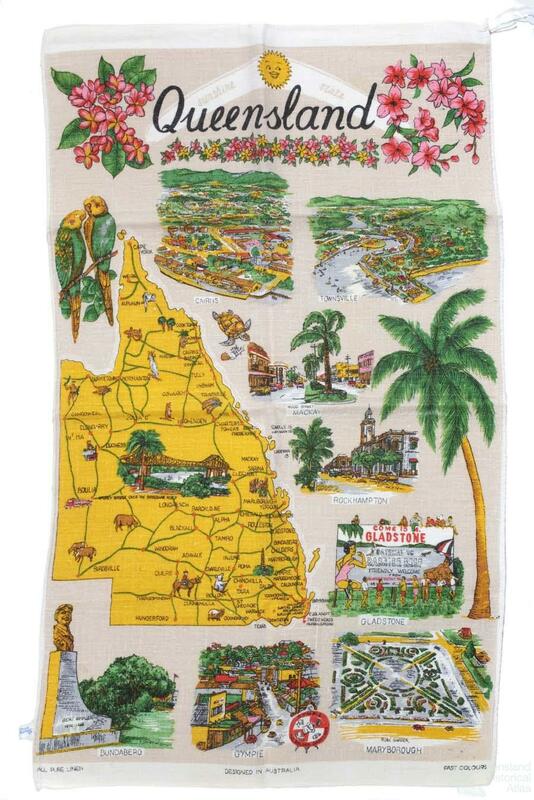 Dating the Queensland Centenary tea-towel is quite straightforward with a generalised map of the state showing road and rail networks and the capital represented by an image of Brisbane City Hall. Queensland industry is represented by a stockman mustering cattle and lifestyle is represented by surf-board riders. 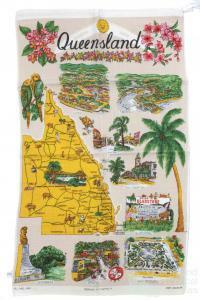 The Map of Queensland tea-towel dates from the same period. It was copied from the souvenir publication 'Queensland Centenary: the first 100 years 1859-1959’. 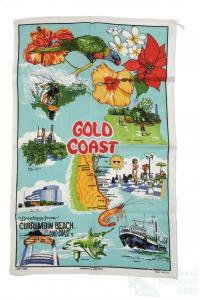 It features a spray of the Cooktown Orchid which was designated Queensland’s floral emblem in 1959. 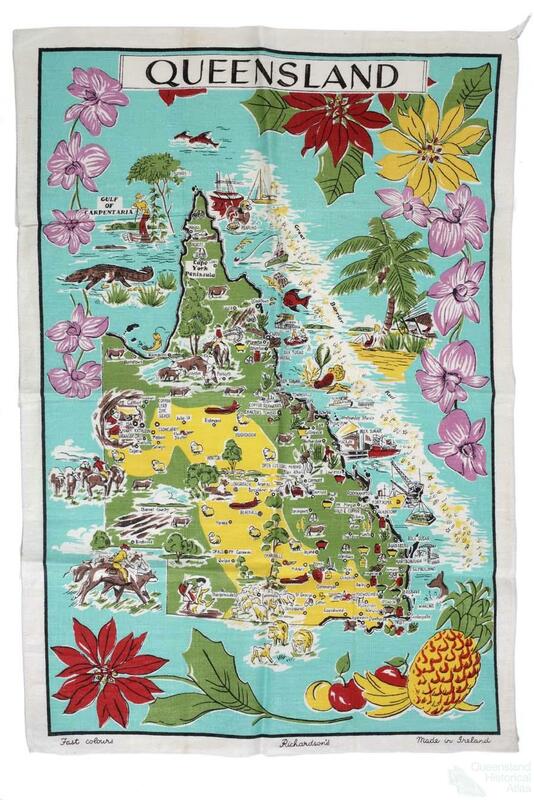 This map depicts symbols of Queensland pastoral, agricultural, mining and manufacturing wealth but tourism, apart from a depiction of the underwater observatory at Green Island and an image of a bather beneath a coconut palm, is unrepresented. The Gold Coast was officially designated in 1959 but the tourism industry had not developed sufficiently to be identified on this map although the whaling industry was. Such state maps continue to be a staple product for the tourism industry. 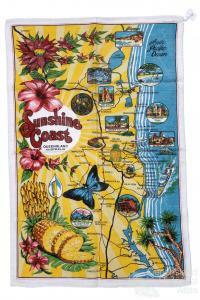 Queensland has been promoted as the 'Sunshine State' from at least the mid-1930s and one Sunshine State tea-towel map from the early 1950s depicts the sites in the major cities along the coastline. Views are included of Cairns and Townsville and down the coastline are images of Wood Street, Mackay, the Post Office, Rockhampton, a billboard of Gladstone as the gateway to the Barrier Reef, the Bert Hinkler Memorial, Bundaberg, the rose garden, Maryborough and a view of Gympie. Brisbane is signified by the Story Bridge. Other Queensland maps suggest different linkages. 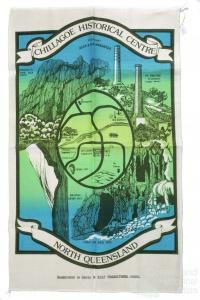 The tea-towel produced by Summit Souvenirs for the opening of the Queensland Country Women’s Association's new hostel in Brisbane in 1961 shows the borders of the regional divisions and, predictably, the industries depicted are pastoral and agricultural. The Great Barrier Reef, Queensland’s iconic tourist destination, is usually depicted as a fringe reef on maps of Queensland as it is too vast to have impact in such small compass. 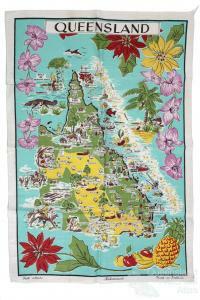 The clusters of holiday islands of the Barrier Reef, however, are shown in many tea-towels: one of the most striking being Lamont's Barrier Reef Pleasure Islands. Islands of small enough scale such as that depicted on Great Keppel Island on the Capricorn Coast reproduce features of the island together with all the entertainments available at a beach resort. The most common maps are those which concentrate on Queensland's two key tourism destinations, Cairns, the centre for exploring the natural wonders of the Great Barrier Reef and its hinterland the Atherton Tablelands and, separated by more than a thousand kilometres, the golden beaches of Surfers Paradise and the artificial attractions of the Gold Coast. The Gold Coast extends as a social continuum into northern New South Wales and the maps of the tourist strip are emblazoned with transient attractions such as the Magic Mountain and Jack Evan's Porpoise Pool. (The latter site was sold for redevelopment in 1976 and its trained dolphins later featured at Sea World) The most striking feature of today’s Gold Coast, the high rise holiday apartments strung along the beach-front from Broadbeach to Main Beach, however, is not 'mapped' from the vantage point of the mountain range behind. It is only since 1960 that the 'Near North Coast', appropriating an association with the Sunshine State, has been promoted as the 'Sunshine Coast'. 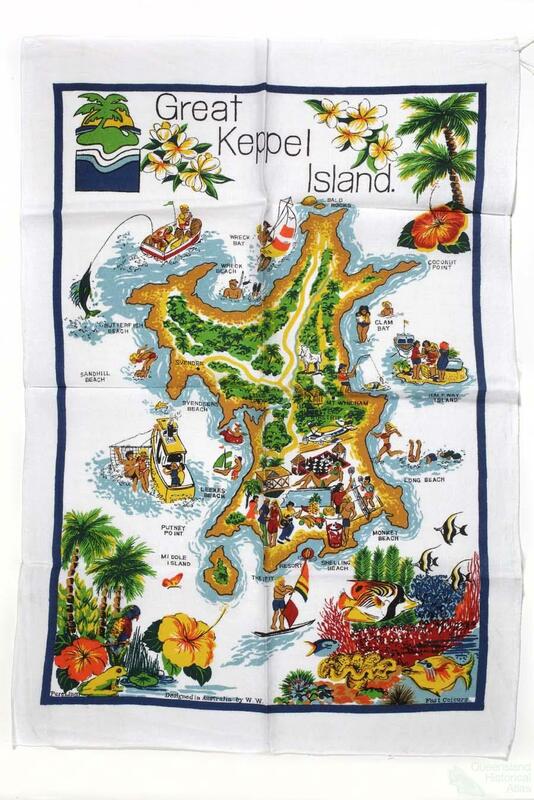 Some tea-towels provide a detailed map of the tourist attractions to be found such as the Big Pineapple, Bli Bli Castle, and the Ginger Factory although many produce their own souvenirs. Other tea-towels incorporate a sense of local history as in Murray View's design of Hervey Bay which acknowledges explorers James Cook and Matthew Flinders as well as Bundaberg's famed aviator, Bert Hinkler. Maps extend to localities such as the natural and built environment around Crow's Nest which features a statue of the Aboriginal identity, Jimmy Crow, for whom the town was named and the hollow tree where Crow resided. Maps extend to even smaller settings such as Ross' Run which depicts the group of historical buildings moved to the Glenora Historical Complex just outside Rockhampton and documents the increasing appreciation of the state’s history and early timber buildings. 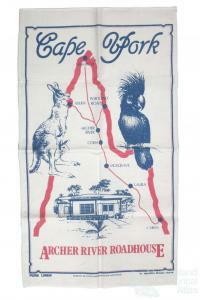 From the 1980 the development of cultural tourism promoted remoter areas of Queensland including Cape York and the far-west. In 1895, while staying at Dagworth Station, near Winton, Banjo Patterson penned the lyrics of ‘Waltzing Matilda' and this Queensland story of control and resistance has permeated Australian culture as unofficial national anthem. Winton's Waltzing Matilda Centre, completed in 1998, commemorates this local connection but a 1989 design by Action Graphics, Matilda Country, has assimilated virtually the whole of inland Queensland, west of the Great Dividing Range, into rural mythology. The Queensland imperative also extends to South Australia in the vast scale of a unique physical feature – the Channel Country. And here the remoteness of Birdsville, the tiny settlement on the Diamantina River on the edge of the Simpson Desert is attested by the signpost to distant and even more distant locations. 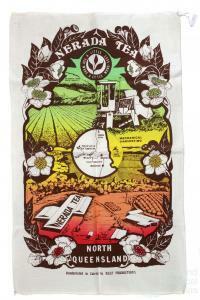 Although symbols of mining and manufacturing industries are recorded on the Richardson centenary tea-towel more detailed depictions are rare. A Lamont tea-towel of Queensland oil industry showing the south-east corner from Roma to Brisbane and including representations of drilling and refining is an exception. Other mining centres, such as Chillagoe, appear on maps but the rusted remains of former activity are now seen through the veiled romance of history. 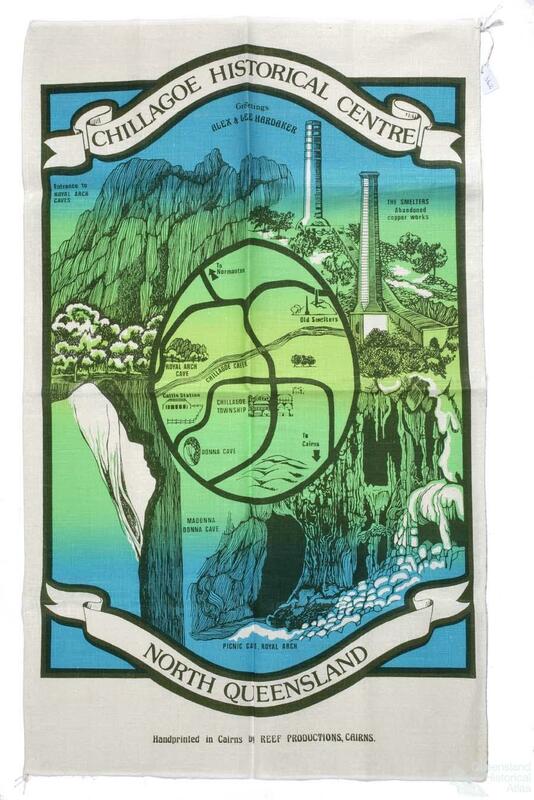 Although individual tea-towels of Mount Isa may depict underground mining and the ‘the tallest smoke-stack in the southern hemisphere’ the vast mining industries of contemporary Central Queensland are unrecorded. 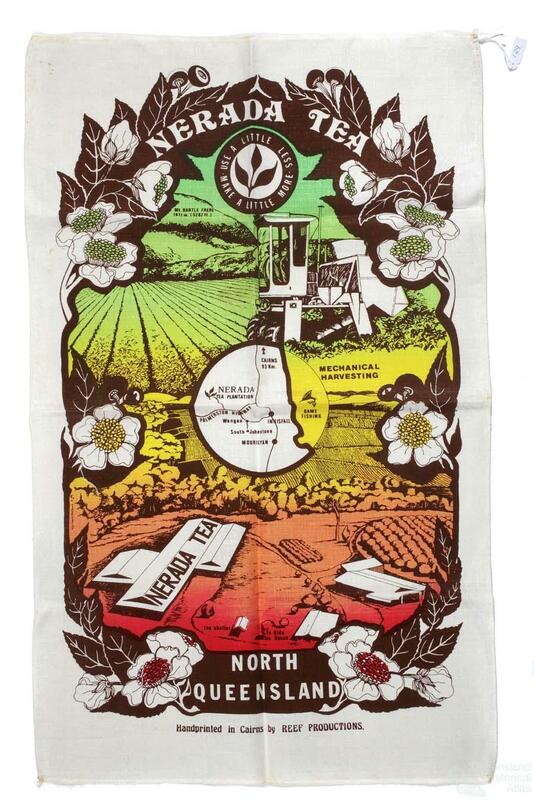 Queensland's agricultural industry receives specific recognition in a Reef Productions souvenir of the Nerada Tea Plantation near Innisfail which is shown amid scenes of cultivation, mechanical harvesting and processing. Although undeniably important to Queensland's agricultural production, sites of the sugar industry are usually shown adjacent to tourist destinations. 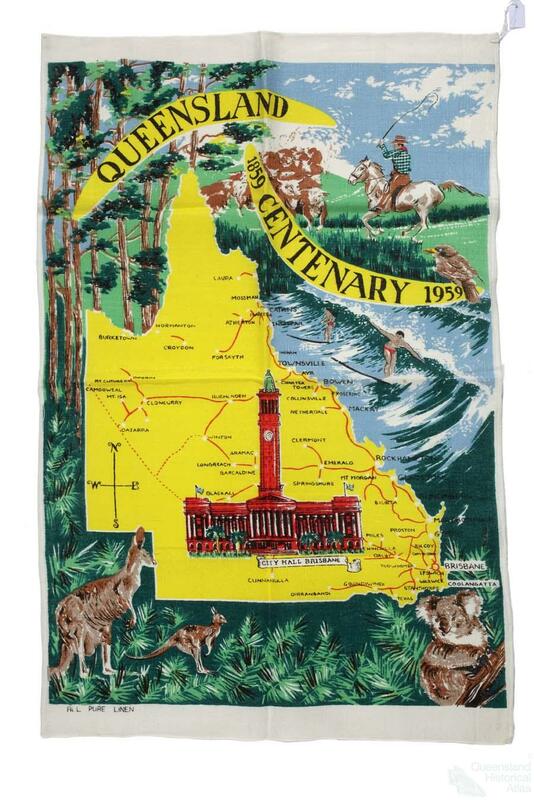 These souvenir tea-towels tell the story of the emergence of state iconography and identity, and mirror Queensland marketing as a distinctive state.